Dina Shihabi (Arabic: دينا الشهابي‎; born 22 September 1989) is a Saudi Arabian-Palestinian actress working in the United States. Shihabi was born in Riyadh, Saudi Arabia, and was raised in Saudi Arabia, Beirut, and Dubai. Her family is of Palestinian origins. She stated that she enjoyed watching films from an early age. At age 11 she began taking dance lessons from Sharmilla Kamte, a renowned dance teacher at the Dubai Community Theatre and Arts Centre Chaloub Studio, known as the "dancing queen" of the United Arab Emirates. She became a member of her modern professional dance team. In Dubai she attended Al Mawakeb School, Emirates International School, and Dubai American Academy. Shihabi performed in numerous school plays, and was encouraged by her teacher, Nancy Mock, to pursue an acting career. At age 18, with her father's permission, Shihabi moved to New York City in 2007 and began pursuing a career in acting; this became a full-time profession for her in 2010. She attended the American Academy of Dramatic Arts for two years. In 2011, she was accepted at both Juilliard and The graduate Acting Program at NYU Tisch School for the Arts. 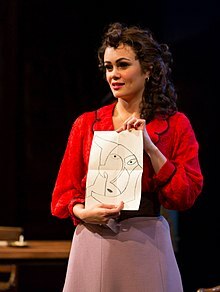 Although Shihabi did not complete a 4 year Bachelor's degree (she attended the American Academy of Dramatic Arts, an Acting Conservatory from 2008 to 2010), NYU waived the requirement of a Bachelor's degree, and she graduated with her MFA in 2014. She is the first Middle East-born woman to be accepted to both the Juilliard and NYU Graduate Acting programs, as well as the first Saudi Arabian woman accepted to these institutions. In February 2019, it was announced that Shihabi was cast in the main role of Dig 301 for the second season of Netflix's science-fiction series, Altered Carbon. She has dance as a hobby. Shihabi's native Arabic dialect is a form of Levantine Arabic.